For a visual reporting of the 12 - 15 October 2016 events [see this album https://goo.gl/photos/uTAbdqdJtrrr7MWD9]. On Tagboard.com you may read and follow the #km4dev2016 tag. [#km4dev2016 https://tagboard.com/km4dev2016/search]. On 14 October 2016, the KM4Dev community will receive the Knowledge Management Award, a prize which has been given since 2009 to outstanding pioneers in the field of KM and/or Knowledge Society. Knowledge Management Austria – as the managing body of the KM Award – has decided to honour the work of the KM4Dev-Community with the KM Award 2016. Here you can find more info on the KM Award. This is the first time that the KM Award has been given to a community – not to a single organisation or individual. The award will be given to given to the KM4Dev community at the Global Knowledge for Development Summit on 14 October. As well as receiving the award, members of KM4Dev will be participating in the summit in many different ways. This will be followed by a KM4Dev meeting on 15 October. In addition, the Knowledge Cities World Summit will be taking place on 12-13 October, also focusing on knowledge for development. These three meetings will be described in more detail below in chronological order. The programme of the KM4Dev day is very much under construction and awaiting your input. 'United in Diversity' more than ever has become a motto for intelligently shaping the future. Knowledge is the best substrate to substantiate such claim. Vienna, rewarded as one of the most recognized knowledge cities, is proud and pleased to welcome knowledge citizens from all over the world to exchange their ideas on advancing knowledge for societal development from diverse cultural perspectives. 14:00 – 15:30 Session 3: Knowledge Café: Partnerships of Knowledge Cities Topic laid out: „How to connect the Knowledge Cities across the globe?“ Impulses and facilitation by Javier Carillo, Andreas Brandner & Günter Koch with a lot of space to think, reflect and co-create. In parallel: Knowledge Camp – KM4Dev Advancing KM for Development – facilitated by the core team of KM4Dev.org Plenty of ideas coming – more or less – spontaneously from the participants, being presented and discussed and further developed in the group. 14:00 – 15:30 Session 3: Knowledge Ecosystems in developing countries – Knowledge Café Topic laid out: „How to strengthen the Knowledge Ecosystems in developing countries?“ Impulses and facilitation by the core team of KM4Dev.org with plenty of space to think, discuss, reflect, and co-create. The registration fee includes admission to all sessions, PhD Consortium, Welcome Reception, Conference Gala Dinner, Coffee-breaks and lunches. Knowledge represents an indispensable asset to individuals, enterprises and governments alike devoted to the cause of human advancement. The Knowledge for Development Community is at the forefront of a movement that seeks to boost international development by making the best use of the plethora of knowledge and creativity available to societies around the world. We find ourselves at a momentous crossroads with regard to the future of international development work. In light of the new set of Sustainable Development Goals (SDGs), knowledge must be a priority on the global community’s stated development agenda going forward. The global Knowledge for Development Community is looking to get to the very heart of these questions and to conceive a set of Knowledge Development Goals (KDGs) for the year 2030. Leading figures in the field of development will be invited to share their visions and ambitions to co-create and collectively constitute these Knowledge Development Goals and an Agenda Knowledge for Development. Based on this preliminary, groundbreaking work, a conference in October 2016 will give opportunity to present, reflect, discuss and deepen the draft Knowledge Development Goals and the Agenda Knowledge for Development. Representatives from governments, international organisations, NGOs, multilateral finance institutions, industry and academia will meet to form a living and breathing community of knowledge, following up on and promoting the achievement of the Knowledge Development Goals. The KDGs we define and the agenda we are setting in the context of this undertaking are in no way binding on the UN, governments, organisations or any other body. Nevertheless, it is our aim to raise awareness, to foster collaboration and to provide inspiration and orientation to those responsible in their societies to promote knowledge for development. 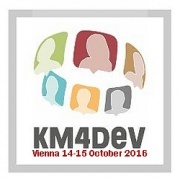 ...then we would be happy if you’d join us for the KM4Dev2016 meeting in Vienna on 15 October 2016. What have we learned from the Knowledge Cities World Summit and the Global Knowledge for Development summit which is relevant for the future of KM4Dev? How do we see KM4Dev developing over the coming years? Although the interests of KM4Dev members are very varied, KM4Dev has had something of a focus on tools and methods. However, other broader issues are emerging: what is the role of KM in organisational development? What are the challenges facing the implementation of KM? What role if knowledge playing in societal development? How do we maintain the vibrancy of KM4Dev? 08:00 – 09:00 Arrival, welcome, registration and coffee desk 09:00 – 10:30 Re-cap and discussion of the previous meetings: what are the implications for the future of Km4Dev? How should Km4Dev respond to the challenges and opportunities identified? This could focus on implications for tools and methods; the role of KMin organisational development and 11:30 – 13.00 How do we see our KM4Dev? This should include Inputs from those unable to be present. How would they like to see the future of KM4Dev? (need to discuss format for this, possibly buddy system so that people present can present others' ideas too). This could include presentation of the futures project and Melissa Bator's study of KM4Dev, followed by discussion in world cafe. 14:00 – 15:30 Development of action plans for the future of KM4Dev. 15:30- 17:00 Discussion with the core group about how they would plan to take these ideas forward. For affordable accommodation consider AirBnB ; YMCA  and similar . If you require assistance with obtaining a visa, please contact Rita Ogunfojuri of KMA, the local organisers, as soon as possible. This page was last modified on 4 November 2016, at 12:11.